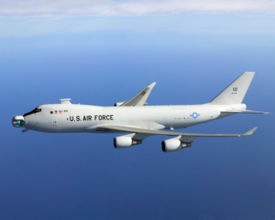 The Boeing YAL-1A Airborne Laser (ABL) weapons system is a megawatt-class chemical oxygen iodine laser (COIL) primarily designed to destroy Tactical ballistic missiles (TBMs), similar to the Scud, while in boost phase. 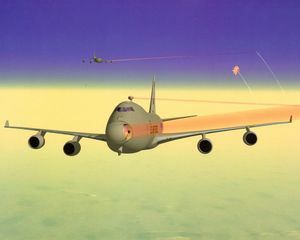 The laser system is fitted to a heavily modified Boeing 747-400F freighter and is still under test. The laser has been test fired on the ground, but not yet in flight. However, a much less powerful early flying prototype successfully shot down several missiles in the 1980s. It was called the Airborne Laser Laboratory, and was a technological pathfinder for the ABL. The ABL doesn't burn through a missile, or disintegrate it. Rather it heats the missile skin, weakening it and causing failure due to flight stresses. If proven successful, a fleet of seven Boeing 747s with the ABL system would be constructed. In operation they would be divided between two combat theaters. Originally scheduled for operation by 2008, due to development difficulties the program was "rescoped". The current plan calls for a prototype ABL to attempt shoot down of a test missile in 2008, delaying the final production design until after this test. The U.S. Missile Defense Agency (MDA) says this is to allow design changes based on data acquired during the test. In effect it delays the ABL attaining operational capability for several years. The plan has been for the MDA and the Air Force to develop two prototype aircraft. The Air Force would then take over subsequent development. While designed mainly for use against tactical ballistic missiles (TBMs), which are shorter ranged and move slower than ICBMs, the ABL has more recently been considered for possible use against ICBMs during their boost phase. This would be more challenging since the longer range of ICBMs would limit the ability of the ABL to reach them. By contrast, tactical ballistic missiles are fired from closer range; hence, the ABL could more easily intercept them without overflying hostile territory. However, some liquid fueled ICBMs have thinner skins than TBMs, so they would be easier to damage. Also, the boost phases of ICBMs are much longer, which gives more time to track and fire on them. But, in general, the ABL would likely be less effective against ICBMs. A 2003 report  by the American Physical Society on National Missile Defense found that if the ABL achieves its design goals it could be successful against liquid fueled ICBMs at a range of up to 600 km. However, its effective range against tougher solid fueled ICBMs would only be 300 km--likely too short to be useful in many scenarios. The ABL system uses infrared sensors to initially detect the missile. Then three lower power tracking lasers calculate the missile's course and speed, aimpoint, and measure atmospheric turbulence. Atmospheric turbulence deflects and distorts light, so the measured turbulence is used by the ABL adaptive optics system to compensate. After that the main laser is fired for 3 to 5 seconds from a turret located on the aircraft's nose, causing the missile to break up in flight near its launch area. The ABL is not designed to intercept TBMs in the terminal, or descending phase. Thus the ABL must be within a few hundred kilometers of the missile launch point. 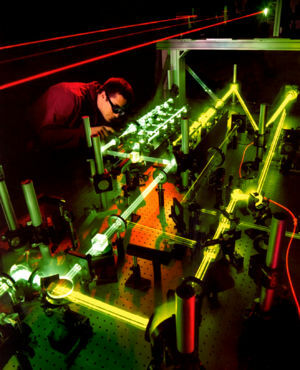 The ABL uses chemical fuel similar to rocket propellant to generate the high power laser. Current plans call for sufficient laser fuel for about 20 laser shots. If a more difficult target such as an ICBM required a longer duration "dwell time" to disable, this would decrease the number of available shots before refueling the laser. If less difficult targets such as shorter range TBMs required less dwell time, possibly 40 laser shots could be made without refueling. The ABL aircraft must return to base and land to reload more laser fuel. Preliminary operational plans call for the ABL to be escorted by fighters and possibly electronic warfare aircraft. The ABL aircraft would likely fly a figure-eight pattern near suspected launch sites for long periods, awaiting an intercept target. A figure-eight pattern prevents the aircraft from having to turn away from the target area as long as the orbit is designed such that both turns are towards the target area. It can be refueled in flight, staying aloft for long periods. The goal would be to stay over friendly territory and fire toward hostile territory to intercept the missile. An .AVI animation depicting the laser interception of a ballistic missile. This page was last edited on 5 March 2007, at 23:06.